Safely and comfortably dive at night or in limited visibility conditions, this skills and concepts required are provided with this program. Some of the spectacular ocean creatures only comes out at night which makes the program more adventurous. Learn how to enter and exit the water, use specialized equipment, communicate and dive with a buddy at night or in restricted visibility. You’ll earn the SSI Night Diving and Limited Visibility Specialty certification after completing this program. The skills and perceptions necessary to safely and comfortably navigate at night or in limited visibility can be learned through the SSI Night and Limited Visibility Specialty Course. Develop your skills and techniques required to navigate into the night and at depths with limited visibility. Gain knowledge about the right light-handling and use of specialized equipment. Admire as you witness the marine creatures that comes out only at night. 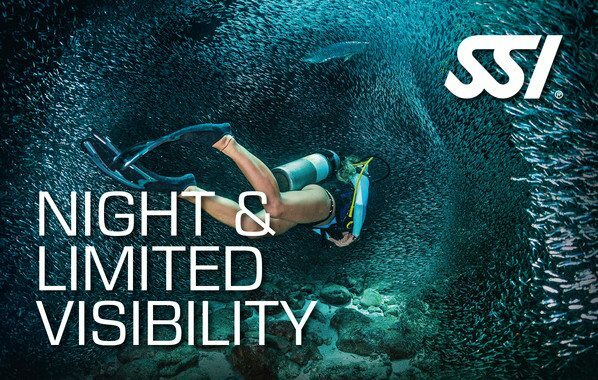 Earn the SSI Night Diving and Limited Visibility Specialty certification upon program completion.